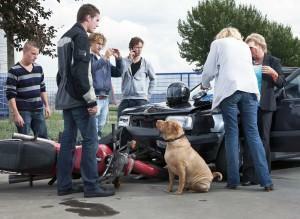 Do You Have a Good Motorcycle Accident Case? Any motorcycle rider who survives a motorcycle accident is undoubtedly glad that it was not worse. After all, while motorcyclists are five times more likely to be in an accident than an automobile driver, they are thirty times more likely to be in an accident that results in death. Nevertheless, many motorcyclists who have survived accidents are faced with large medical bills. Injuries resulting from an accident can mean thousands, maybe even millions, of dollars for treatment and therapy. This can be especially exasperating when liability is debated. After all, fault is often unclear and requires not only a perspective, but evidence, and if a motorcycle rider loses his or her case, it will most likely mean that he or she will have to pay his or her own bills. First, if you have been in an accident and are seeking compensation for injuries sustained, and you argue that the accident was not our fault, your case will be what is called a liability case. This means that it will center on determining responsibility (liability) for the accident. Thus, as the motorcyclist, you will attempt to prove that the accident was not your fault, but that it was the other driver’s unsafe or negligent behavior that led to the crash and your subsequent injuries. In the majority of two-vehicle motorcycle accidents, the other driver is most often responsible. Did the driver do something that caused the accident, such as swerve out of his or her lane, hitting a rider or otherwise forcing him or her into an accident? This would also be the case if the other driver failed to see traffic signals, such as if he or she ran a stop sign or a red light, which resulted in an accident. Did the driver not do something that caused the accident, such as exercise the right amount of care while driving? This is often the case – in fact, the primary cause of motorcycle accidents is when a driver is negligent, most often while taking left-hand turns and not spotting oncoming motorcycles. If you believe that you can prove either of these possibilities to be the truth, then you may have a good case. Keep in mind that you need to remain objective about what happened. This makes it very important to do such things such as interviewing witnesses, writing down each detail that you remember about the accident, and photographing your injuries as soon as possible. The motorcycle’s design was flawed, which directly led to the accident and subsequent injuries. The motorcycle was somehow damaged before your purchase of the vehicle, such as during shipping, and this directly led to your accident. The manufacturer had issued a recall for a flawed part, but did not follow the proper methods of alerting the customers. As is to be expected, these cases are often much more difficult for a plaintiff to win, being that it can be quite difficult to prove direct causation. In addition, companies typically have excellent legal counsel. Should You Get Legal Help? Since filing a liability claim for a motorcycle accident is a daunting task for most people, you may also want to consider hiring a Georgia motorcycle crash injury lawyer who specializes in motorcycle accidents. You do not want to make any mistakes while preparing or arguing your case, and hiring an attorney can certainly increase your chances of a positive outcome. Additionally, attorneys are able to gather the right evidence, including the taking of pictures and retrieval of witness accounts. In all, what matters most is that you make a convincing, supported argument. If you or a loved one have been injured in a motorcycle accident in Georgia, no matter the circumstances, contact Van Sant Law so we can talk about what happened, your injuries, and how to best proceed to obtain compensation. The time to file a legal claim is limited, and trying to work directly with an insurance company could be a serious mistake leading to a substantial loss of compensation. Fill out our free, no-obligation online contact form, or call Van Sant Law today at (404) 991-5950.